We arrived at the Fiumicino airport in Rome in Terminal 1 from Amsterdam. We needed to get on the FR1 to go to Trastevere station as our apartment was near there. After getting our luggage it was easy to follow the signs through pedestrian walkways to the railway. Apparently you can also exit the terminal and enter the train station across the street outside between parking and office building, but we found it easy just going up to the second floor and following the signs for the airport train station. It is in the same place as the leonardo express that you catch to go right into Rome. The Leonardo express was on the center track it was red green and white. The Fr1 had two trains using both tracks on either side of it as it goes two ways and it is blue and white. Purchase your ticket at the window for 8 euros and verify it in the yellow machine. It goes both ways so we had to get on the one going to Orte. It is important to validate your ticket in the machine because they run on the honor system. If you get caught on a train without a validated ticket it is a 100. euro fine. The Fr1 is not as pretty but fine. We got off at the Trastevere station. The green red and white validating machine goes with the Leonardo with colors like the train and the ticket is more expensive. 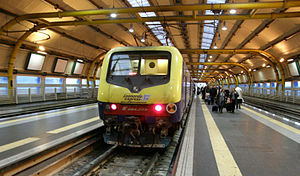 It is easier to board than high-speed but watch the space between the platform and the train. It is nice that the train is close to same level as platform. Here is the route. Make sure you pick the train going to Orte , get ready to get out after the Villa Bonelli stop as Trastevere is next. It was very quick and easy with not too many stops from the airport to Trastevere. Because it was off-season in October the train was not full and so it had lots of empty seats. If you go in a busier season you may want to make your way down to the door sooner. Here is the route off the Trenitalia site. When you get out at Trastevere you go down the stairs and up on the other side to get to the front of the station. There are elevators and I made the mistake of using them. Going in the down elevator was o.k. but it got stuck between floors on the up on the other side. Lucky for us a lady was on it that seemed very familiar with this problem. I think it’s happened before! Well, she was waving her hands making all sorts of gestures. Calling someone on her cell phone, ringing the alarm by holding it down several times. I saw someone looking in at us and I knocked on the window and mouthed… help. I don’t know if he understood but he nodded and walked off . Finally someone came and I could see him cranking the elevator back down. It was extremely hot in there and I was wearing a rain coat and cardigan. Rome was unseasonably warm this year. ( we lucked out with such good weather) When we got off the elevator I was wiped out… as if the flight hadn’t already done me in. I caved in and let my husband carry my suitcase up the stairs as I was so weak. Had I been alone I would have dragged it up the stairs… they were ominous. We were close enough to our apartment to walk as it was just a few minutes from the train station and once we were up on the other side I was able to wheel my luggage. Train travelling on the tracks near the Trastevere station. This picture shows a train going along the track. This was very convenient to be located near the Trastevere station. 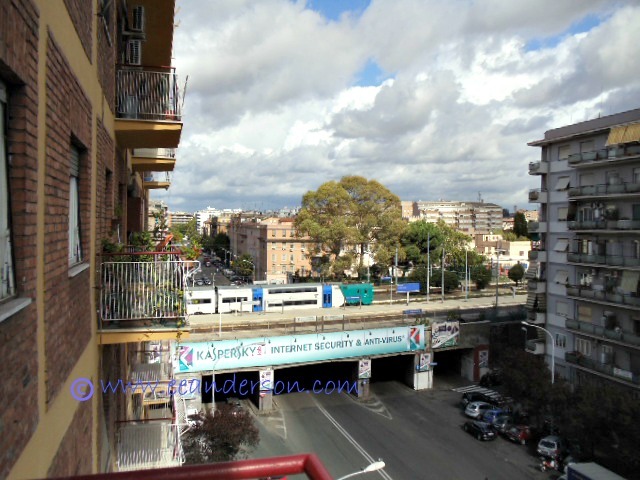 This entry was posted in Italy, Travel, Travel tips and tagged Alitalia, FR1 regional train, Leonardo da Vinci-Fiumicino Airport, Rome, Trastevere, Trastevere railway station Rome. Bookmark the permalink.